Obviously the title of the book has something to do with it. Even at my age, who can resist being seen reading something with such an in-your-face title? 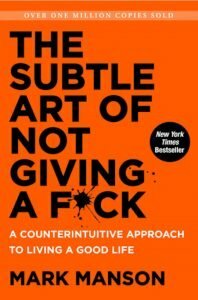 “The Subtle Art of Not Giving a F*ck” certainly delivers on the shock value, with the F word peppering the earlier chapters, but you know what, it’s actually not a bad read at all, shock tactics notwithstanding. Mark Manson, the 30-something author, has achieved maturity and wisdom beyond his years, and much of what he says made sense. Seriously, why couldn’t I have read this book in my 30s? It might well have given me the courage I so clearly lacked at the time to say “no” to so many futile things. School art projects, for one…helping the kiddos make a model of the Great Pyramid of Giza out of toilet rolls and kitchen paper rolls being one of the worst time-wasters of my life. Ah well, I didn’t have the benefit of Mr. Manson’s trenchant advice at the time. The author makes some very interesting and thought provoking statements to make his pretty-much central premise that 99.99% of us are, in point of fact, not special. Whew! Spoken like an old fogey like me, not a youngster. How refreshing! I enjoyed the book, and it made me smile in many places. Anyone who quotes Yoda is a star in my book. I enjoyed the author’s vivid use of language, truly I did, including that fabulous verb “to unpretzel”. I applaud his view of how to live your life. Since this is a review of a book encouraging a counterintuitive approach to life, I won’t tell you how to go ahead & order your copy…you can work it out for yourselves, right? !